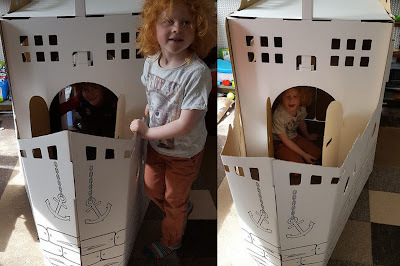 I asked my boys which Wiplii cardboard model they preferred and although secretly I really hoped they'd choose the Castle, they chose the Pirate Ship. I knew that our Manchester weather doesn't really allow for playing outside with cardboard very much, so the ship would be indoors for now at least, but I still didn't appreciate how big it was going to be - it's super impressive! It really is just like any other cardboard model you might make - but large scale! The instructions are really clear, and the thick card easy to work with. The first pieces have a bend, so stand up by themselves while you are building. One person can build the pirate ship alone without getting frustrated. My young boys were keen to help though, and with their assistance (or maybe in spite of it) the entire ship was built in a stunning 12 minutes! 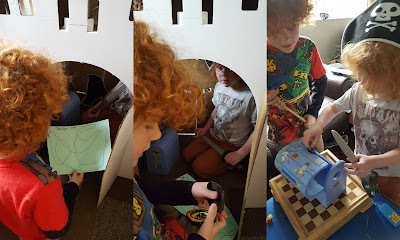 The 3D windows are a great touch - and make a great place for hiding treasure! 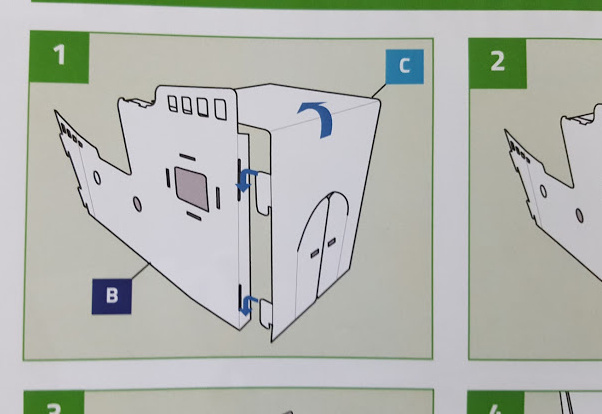 They're big enough to be useful windows too. 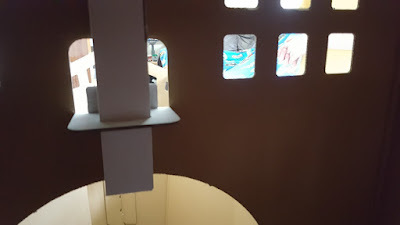 There are windows all around the ship, which makes it really quite light inside and it isn't claustrophobic, even with both sets of double doors closed. 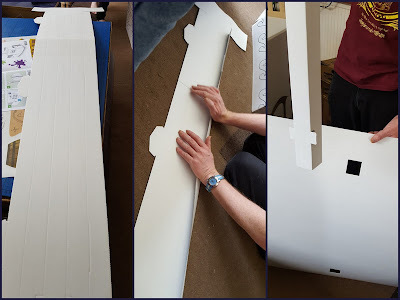 The mast is the trickiest bit, and that's mainly because of the size, but it's still really easy to slot into the top of the ship once it's been assembled and the sail is in place. 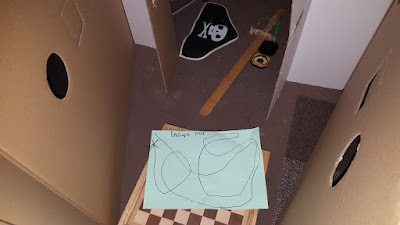 The fun doesn't end there. The complete Pirate Ship is white cardboard and ready for you to decorate however you want - building creativity and fine motor skills. My boys have chosen to keep our Pirate Ship white until they agree on a colour, and when the weather is drier we will take it outside and paint it. 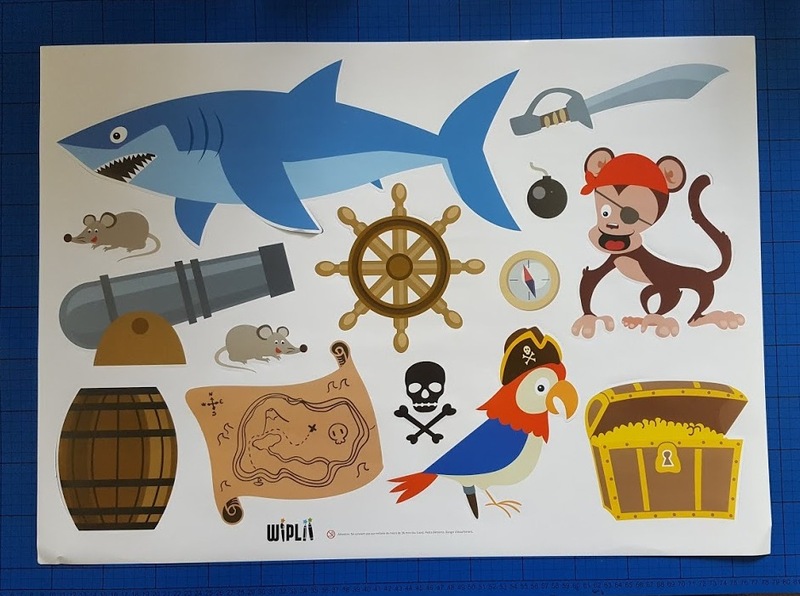 You are also supplied with a sheet of really excellent quality huge stickers - our pirates have chosen to put the skull and crossbones on our flag - which gives an idea of the scale! We absolutely love our Wiplii Pirate Ship, and so does everyone who's seen it. It's truly awesome, and irresistible for any child. 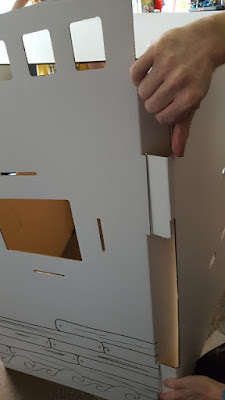 It's had some rough use and it's come apart a few times at the corners, but we just slot it back together and carry on. 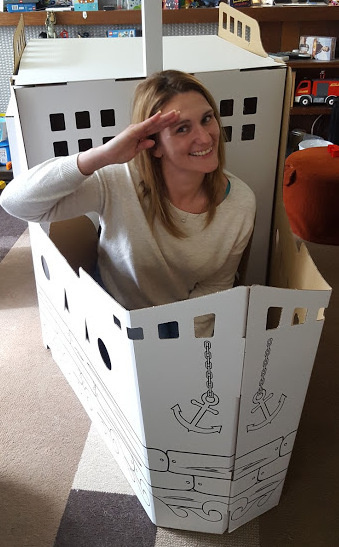 The ship has details like the cannon slots, portholes and 3D cabin windows, plus windows to see ahead and behind, as well as front and rear doors. The shaping is perfect and it's incredibly strong and steady, yet light enough for me to lift and move easily. 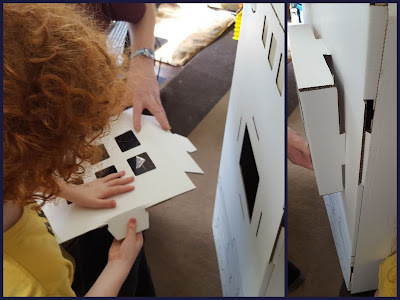 The construction is so simple, yet requires perfect sizing to work, and this really does. 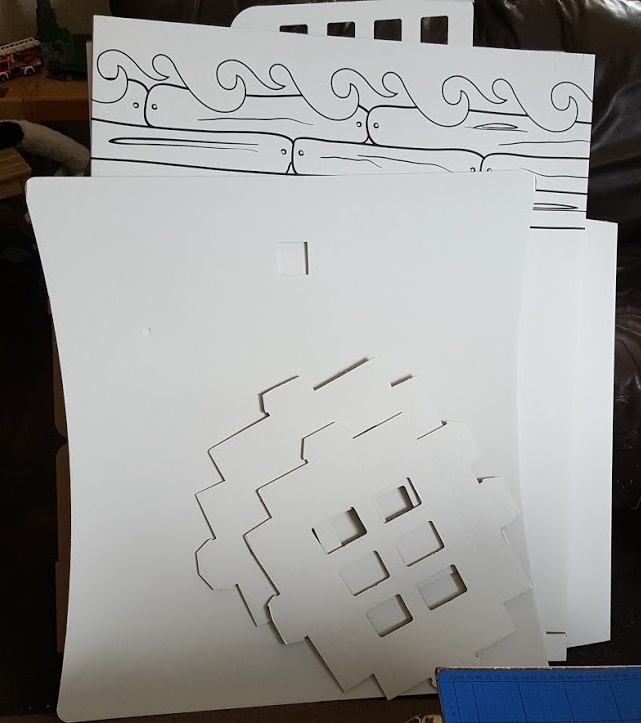 The way the tabs, folds and slots work so well on such a big scale was incredibly impressive. 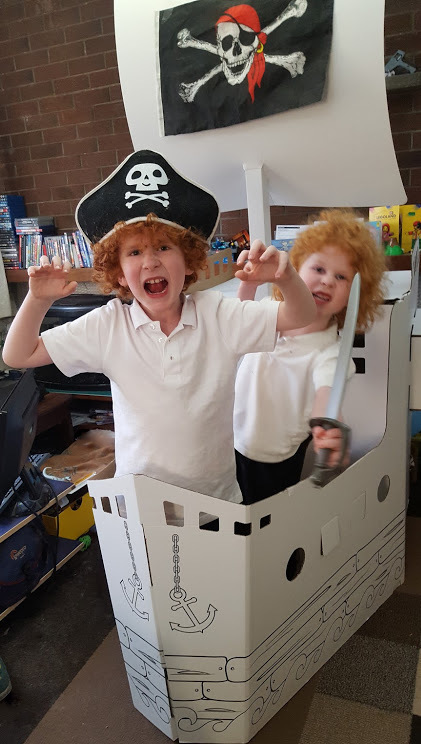 I really can't fault the Wiplii Pirate Ship, it's brilliant. 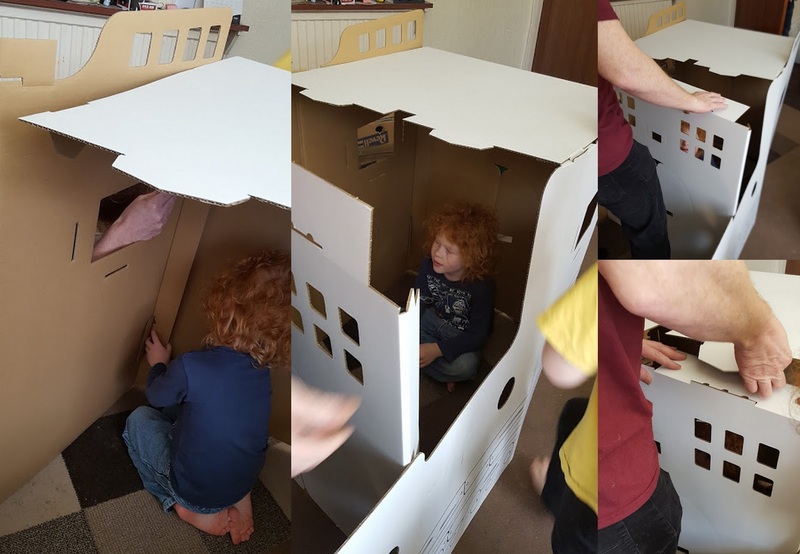 Both of my boys love it, and it has kept them away from screens and playing nicely together for many hours. 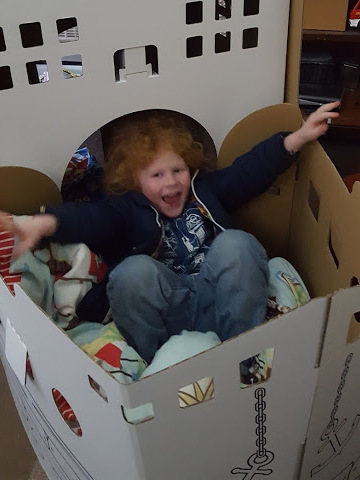 It is big and we are blessed with a big living room, but it actually pushes out of the way to the side, and is the biggest model in the Wiplii range. The Castle, Tepee and House are all also available. 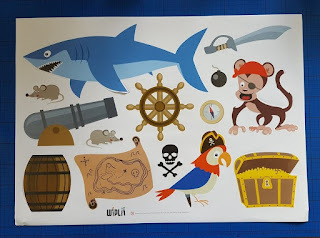 Wiplii are fairly new to the UK, and shipping is a mere 7,90 € (£6.15) per item. Don't be deterred by the price in Euro's, for a current exchange rate type the total into Google and it'll tell you exactly what you are paying in £'s. 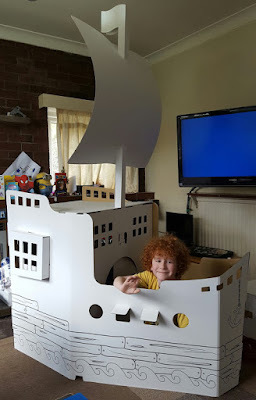 The Wiplii recycled cardboard giant Pirate Ship currently costs 49,90 € (£38.82), which is an investment, but it's a great present. The smaller models start at 19,90 € (£15.48) for the house. 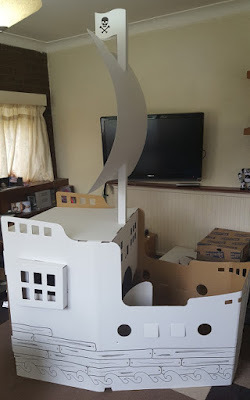 We were sent our giant recycled cardboard Wiplii Pirate Ship for review.